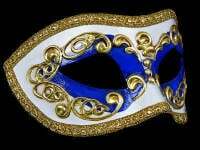 Shimmering antique gold, cream & sky blue painted base with gold braid edged detailing.....Fantastic Venetian Masquerade mask! 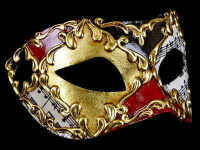 Exuding pure elegance with a modern fashionable twist, this must-have party mask will look fabulous worn with your favourite jewellery, guaranteed to make you storm ahead of the latest fashion trends & stand out from all your friends. With black satin traditional ties for a comfortable fit the mask is perfect accessory for men & women this season. 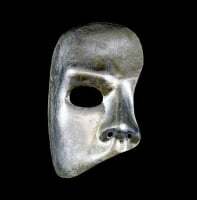 This mask has been handmade in the genuine Venetian tradition for Simply Masquerade.